Home » Learning BJJ Faster » Is it normal to plateau while training BJJ? Is it normal to plateau while training BJJ? Yes, plateaus are very common in Brazilian Jiu-Jitsu. You’ve likely experienced one if you’ve been training for any length of time. You feel like you’re not getting better, or that you feel directionless, or that you are less motivated to train. This is normal. Brazilian Jiu-Jitsu takes a long time to get good at. 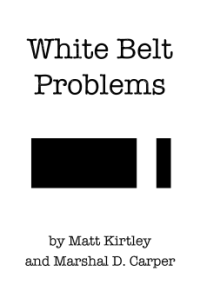 It takes around a decade to earn a black belt, and even then you’ll still be working out the kinks (they are just smaller kinks). Talk to world champions and seasoned instructors with decades in the art, and they will tell you they are still trying to be better. BJJ is endless. So what’s the rush? You can be tricked into thinking you’re not getting better if you don’t realize that your training partners are all getting better too. When you measure your progress based on being better or worse than other people, you can be fooled into thinking you’re not moving forward. Don’t forget that everyone should be getting better too. Some improvements are subtle, making them harder to see, like improving intangible skills like your timing and sensitivity. As you become more experienced, the changes to your game become less pronounced. When you teach a white belt a new position or move, they are going from knowing nothing to knowing something. That’s a big change. But once you’re familiar with a lot of positions and techniques, you’re just going from knowing something to knowing something a little bit better. 1. Pick a specific position, guard or submission and work on it as much as you can. Study instructionals on it. Put in extra drilling of it. Make it the only thing you go for in sparring. This gives you a specific area to measure your progress. 2. Set your sights on an upcoming tournament, and restructure your training regimen to prepare for it. 3. Maybe you’re getting burnt out on BJJ, and it would do you some good to enjoy other activities again. Get out and do something new. Once you’ve cleared your head, you’ll likely feel the itch to train BJJ again. 4. Watch an exciting BJJ event that gets you pumped to train again. 5. Team up with another student who wants to put in extra time drilling and sparring. A good training partner can help you stay motivated. The main advice is to just keep training. These kind of frustrations about BJJ tend to work themselves out if you just keep getting on the mats, pay attention in class, and stay mindful of what you need to improve next.